*To preserve and maintain our laid-back atmosphere we do not allow: Persons under 18 year of age or above 40 , pets, any bookings of stag nights, hen nights or sport tours, soccerfans for (inter)national matches and large groups of males ( 6 persons or more ). Read the above carefully because in the event of a false booking, there will be no check in nor will there be a refund. *We try to accomodate groups in 4-, 6- or 8-bedded dorms with bathroom. We will inform you if not possible. *A form of Photo Identification is required upon check in. Accepted forms are a valid passport or national ID card. Driving licences are NOT accepted. Hostelworld guests at Flying Pig Downtown frequently comment on the hostel's high standard of cleanliness as well as their staff, who one of our visitors described as 'adorable, very friendly, talkative, helpful and always in a good mood'. We like this hostel's location in a central area of Amsterdam, about ten minutes from the Centraal Station 'which was easy to get to from the airport', making it the 'perfect way to experience everything Amsterdam has to offer'. Reviewers tell us this is a good place to meet fellow travellers as there are usually 'people hanging out at the bar, playing pool or socialising'. 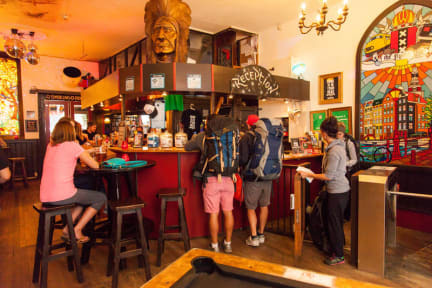 Do you want to hang out in one of the most famous hostel bars, including an indoor smoking area with pillow stage? The Flying Pig Downtown is the place to be, located right next to Amsterdam Central Station. We have dorms where every bed has a reading light, as well as private rooms with a little fridge and TV. Rates include free linen. There are single and queen-size bunk beds as well as a shower and toilet in most of the rooms. There are also free individual lockers in the rooms; bring your own padlock or buy one at reception for just €3,50. The Flying Pig Downtown provides free use of the guest kitchen, luggage storage, free Wi-Fi, a book exchange and a lively hostel bar with DJ nights and the cheapest beer in town. There is also a buffet style continental breakfast available everyday for only €4. Meeting people is very easy at this hostel while chilling on lounge pillows in the smoking area, drinking and playing pool in the bar, dancing to the music of local DJs and cooking meals in the guest kitchen. We’re open 24hrs with keycard access to the hostel and there’s no curfew or lock-out. You can use the safe behind reception to store small valuables. Our reception offers tours and tickets to Amsterdam's attractions as well as Piggy merchandise. We offer a free walking tour that picks guests up from the hostel everyday, a daily updated Amsterdam agenda, and a free detailed map of Amsterdam and discounts on several things to do in the city. Leaving the Central Station, it is just a five-minute walk to the hostel and during this walk you'll already see the many restaurants, pubs, red lights of the famous Red Light District and shops. That's the party area where you'll most likely be spending your nights. The hostel entrance is in Amsterdam's busiest shopping street and it is a perfect place to kick-start your night of club-, pub- and coffeeshop-hopping. Besides everything the hostel offers you, our international Piggy staff can provide you with all the information you need to get the most out of the Amsterdam experience. Close to our hostel you will find the Red Light District with its famous windows. It’s very safe to walk around here and a good place to hang out when the night falls. There’s also Anne Frank House which brings you back to the time of the Second World War. In this house Anne Frank and her family hid away for years, before being deported to the concentration camp. The Royal Palace is very admirable too with its spectacular 16th-century halls and rooms, and Dam Square with its musical groups, performers and other entertainers. Please note that we do not accommodate guests under the age of 18 and a form of Photo Identification is required upon check in. Great stay. Great staff. Great location. Will be back and recommend to all. Great place to stay! We've been telling everyone we meet going to Amsterdam to stay here. The staff was great and super helpful and accommodating. Thank you to Junior, Edu, Lilly, Marge and Ben. Great Location you can walk to everything and has a great vibe! We were super happy with our stay! Absolutely loved our stay here! Staff was incredibly helpful as we had a few issues with cards, we had to receive mail there, and just giving us info on things to do around Amsterdam! So thank you! Met a ton of awesome people drinking at the bar one night, those prices are hard to beat. Only thing was the bumping music at 3am. Would definitely stay here again! Everyone at this hostel was incredibly nice and helpful. It is located less than five minutes from the train station, and they had a great breakfast selection for a good price! The bed in my room was comfy albeit very creaky whenever myself or the person above me moved but that’s just how it is. Very welcoming staff, good location nice and central surrounded by a tonne of places to eat and shop and just a short walk from Centraal train station meaning easy walking distance as you arrive and leave but also quick access to city transit services and a hub for canal tours. Only things I could wish for are less creaky beds, and perhaps privacy curtains for the beds. Great location. A bit expensive for a hostel private room. Rooms are pretty clean, comfy beds but room is small... but that doesn’t matter because you should be out exploring the beautiful city. Reception folks were friendly. Great location to learn way around city.